Suspended Animation is the first full-length album on Joan Male's (aka Monoceros) label Imaginary NonExistant Records by Jorge Ortiz de Pinedo, young electronic weaver from Madrid also known as noi, or better by his most accessible alter-ego Stable Mechanism, a project whose rhythmicity and compositions are far clever and less inscrutable than the mentioned artistic identity he named noi. Its title could act as both a sort of conceptual framework and a guideline for listener: the so-called suspended animation consists of the slowing of organic processes such as heartbeat, blood circulation, breathing and other involuntary living functions by gradual decrease of temperature, one of the basic concept of the science of cryonics, successfully experimented on embryos, rats and partially dogs (as some dogs which have been submitted to this experiment of induced hypothermia experienced some mental diseases), which someone has proposed to experiment on astronauts for interstellar or intergalactic journeys. Stable Mechanism's playset seems following such a process: Jorge erects rhythmical structures and sound sculptures on some chilled synth pad's 2-tonal drones, which could remind sci-fi soundtracks, acting as nitrogen for computer assisted freezing or alternatively fuel for space capsules going towards unexplored angles of the universe. Far-off echoes encounters ethereal and rarefied melodies (such as in the beat-spotted suspended crystalline celesta score of Spacetime Distorsion or in the enwrapping quasi-drone of Antimatter, maybe the best track of this issue), escorting the listener towards a mental journey throughout sidereal icy spaces, which doesn't lack of somewhat romantic moments (tracks like the above-mentioned Spacetime Distorsion, the "beepy" Intense Vacuum,featuring a bizarre mixture of that kind of ethereal restlessness marking the first steps of Autechre or Boards Of canada, or The Deep Loneliness reminded to me some reveries on sadly frustrated "human-like" robots falling in love each other induced by listening some melancholic-tinged Norken, Pole, Proem or Metamatics tracks!) or mystical diversions close to the ones noi recently showed out in some digital releases. I wish you a pleasant intergalactic mental trot! I hadn't heard any new music by NY-based Icelandic bass player/composer SkÃºli Sverrisson's since his highly acclaimed 1998 solo-bass ambient-music release "Seremonie" on Extreme records (which I believe was re-issued in 2007). Although I discovered it only this year, after hearing his 2006 CD "SerÃ­a" it quickly became one of my favorite CDs and I've been listening to that one a lot ever since! The second installment in that series came out this year on the same small Icelandic indie record shop/label 12 TÃ³nar and is appropriately called "SerÃ­a II". Both CDs feature a large number of international guests from NY, Seattle, Reykjavik and other places, including Amedeo Pace (Blonde Redhead), ÃlÃ¶f Arnalds (violin), Hildur GuÃ°nadÃ³ttir (cello), the great viola player Eyvind Kang with his instantly recognizable tone, Anthony Burr (clarinet), Ãskar GuÃ°jÃ³nsson (sax), KristÃ­n Anna ValtÃ½sdÃ³ttir and pianist DavÃ­Ã° ÃÃ³r JÃ³nsson. Recorded between MosfellsbÃ¦r (by Birgir ÃÃ³r JÃ³nsson), New York, New Orleans and Berlin, "SerÃ­a II" represents a small departure from the intense and beautiful arpeggio-structured songwriting of the gorgeous title-track of "SerÃ­a" (although still very much present in pieces like "MoÃ°ir" or "Without Memory") and shines the light on sometimes more defined melody lines ("Instants") as well as introducing a few more singing parts (the only vocals in "SerÃ­a" were a spoken word part by Laurie Anderson and one sang piece called "Sungio Eg Gaeti"). On "SerÃ­a II" MÃºm vocalists Anna ValtÃ½sdÃ³ttir and ÃlÃ¶f Arnalds deliver beautiful layers of vocal cords mastery, although not necessarily vocals in the "pop" sense of the word (in fact I believe there are no lyrics at all). The vocals are used as an instrument, almost like a keyboard pad (but not necessarily always just long notes), sometimes almost operatically, and blend into the music in a very organic and harmonious way, like in the opening track "Volumes", "Unbend", "Divena", "The Arrangement" or "The Sound of Snow" to the point where sometimes it makes you wonder whether you are hearing a voice or an instrument. SkÃºli's compositions float in a space of their own, ethereal but dense, with a multiplicity of stringed instruments, acoustic and electric, untreated and processed. Equally comfortable on an unplugged acoustic bass guitar or on a five string electric guitar with a sea of pedals in front of him, Sverisson's strongpoint probably lies in his versatility, one that is showcased in this release. Needless to say the level of musicianship is sky high and the contributions of the guests are an extension of SkÃºli's multifaceted vision. The whole CD is just so beautiful from start to finish that you are gonna wanna keep listening to it over and over, discovering new nuances and subtle arrangements after every pass. I've seen (and even worked with) SkÃºli Sverrisson in different situations, from playing fusion with Allan Holdsworth to playing alongside Ryuichi Sakamoto, Laurie Anderson, Chris Speed and he is an amazing bass player, tactful, with pocket and style, however I truly believe that his musical sensibility comes out most and best when he composes and plays his own music. I urge you to discover his musical genius by getting "SerÃ­a" and "SerÃ­a II" as soon as you can. I'm not sure whether this is a trilogy or how many chapters Sverisson envisioned this series to be made of, but at this point I'm eagerly waiting for "SerÃ­a III"! I loved this Monotype release from the very first listening and before writing this review I've listened to this record many times. We're talking about laptop music and this trio infact features Jacek Staniszewski on computer and synth, Artus Kozdrowski on computer and adat recorder and Dominik Kowalczyk on laptop. Given the fact this music has been recorded between 2001 and 2005, this trio gains more and more respect for the high quality of the tracks. You can bet this' one hundred percent laptop music therefore expect: digital bleeps, loops, samples, unnatural white noise, weird sounds and that kind of sound aesthetic you usually have with such projects. At the same time this trio reaches an incredible intensity above all when mixing soft harsh digital noises with loops of blues singers or with simple melodies, litanies have been always kept under the surface but you don't have to strain so much to here them. Despite some melodic solution this release is basically serious music oriented and most of the episodes express a deep and thoughtful intensity and "What do we need to know?" is the perfect example of that kind of austerity. Differently from what I've just wrote may suggest this project's compositions are not so heavy but not absolutely to be confounded with quasi-ambient/IDM/abstract light music. Neurobot played that style of music that walks on the tight rope between academic abstract computer and post-industrial/installation music. Different layers of sound, serial loops, some sad melodies fighting with astral synth to conquer the scene, digital bleeps facing soft harsh drones and everything has been dragged around patiently but not so much to sound heavy. After ten years this music still sounds quite interesting and if you consider the tracks may result odd but also well assembled, you may get why I this work is definitely worth of a listen since it's definitely interesting. 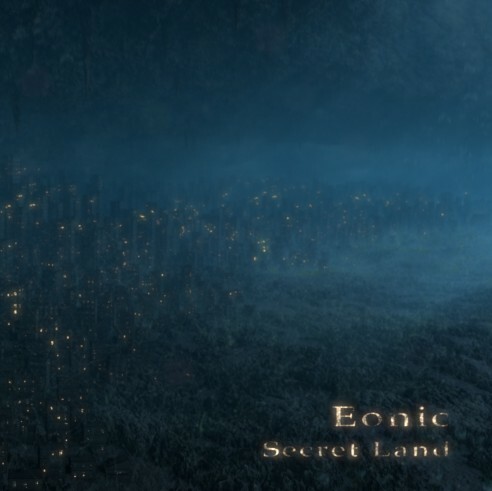 Eonic is a russian duo whose music is based on a mix between ethnic rhythms and ambient lines of synths. The result, influenced by names like Arcana and Enigma is pleasing and, sometimes, even remarkable. "Easterly Wind" takes attention using an hypnotic reversed loop. "Secret Land", "Desert Island" and "Temple of Silense" dangerously approach the perilous coasts of new age, dampening the meditative mood of the genre with the help of the rhythmic sections. Near the end of the album "Abandoned City" takes the listener with a surprise a solemn field of synths evolving over an ethno rhythm in a real mix of genres. The rest of the album is a sort of new age dance music, clearly influenced by Enigma, but fortunately with a sort of personal gothic view in the songwriting. This is a strange record: even if is not openly original, it escapes the faults of their musical model making the classic records that someone likes but doesn't know why. A record for the times of the day one need a soundtrack for a mind relax.